The event commenced at 14:30 in Durgadevi School at Grant road. 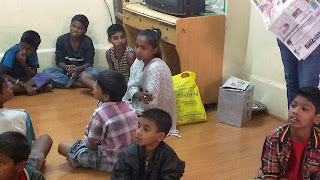 Around seventeen shelter kids and thirty five street children had showed up. 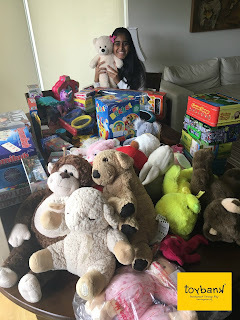 As soon as we brought the cartons filled with toys into the room, the gloomy and poignant atmosphere got electrified. The children yelled. They were loud. Really loud xD. They knew what was inside the boxes and they showed it. I’ve never seen happier faces. Unconstrained and free in joy as they were, their excitement was going to last for a while. To our surprise, a reporter and a cameraman from ABP news had turned up to capture the whole happening. Amruta and the Toybank team began by introducing Pictionary to the whole batch. The kids were thrilled to learn a new game. In the beginning they were a bit reserved but after the first picture, everyone wanted a shot at it. 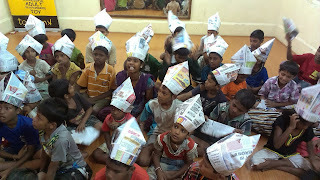 Later we indulged into making Hats out of Newspaper. We split into four groups so that we could pay better attention at each child. It was a lot of fun really. And the whole lot was surprisingly quick and smart. All of us put the recycled Hats on with a lot of pride for the rest of the event. 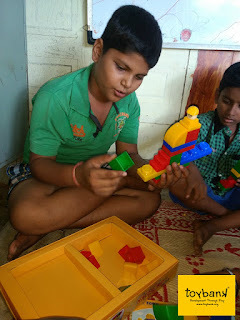 There was this game called “Ten Common Things” which the children played in the same groups. They had a lot of common things. Mostly it was playing. But Yeah, they seemed pretty comfortable with each other. After all the fun and frolic, we turned to the highlight of the occasion. The kids were trying to contain their exhilaration, but their unusually broad smiles gave them away. Ruta and I gathered some information about the kids on a Data sheet before giving them their toys. The toys were wrapped in newspaper and so the children were given instruction to handle them delicately, otherwise the packing would’ve come off. The Reporters asked the kids a few questions, to which, they replied spontaneously giving their honest answers. Subsequently all of them filed out of the room, with a smile across their faces and thoughts of opportunity. The reporter interviewed Shweta and the people of CORP. And that is how the experience concluded on a positive note.